At Bruce Auto Group, you can extend your vehicle's lifespan, increase its retail value, and keep it turning heads on the road all year long! Protect your investment with Rust Check, the industry standard for corrosion protection since 1973! Rust check keeps moisture off of your vehicle while lubricating it, and doesn't damage paint like other sealants. It's also safe, non-toxic and works on all types of surfaces, so your vehicle can stay in top condition no matter what life may throw at it. Plus, with prices starting as low as $119 for cars and $139 for trucks, you can't afford to miss out! 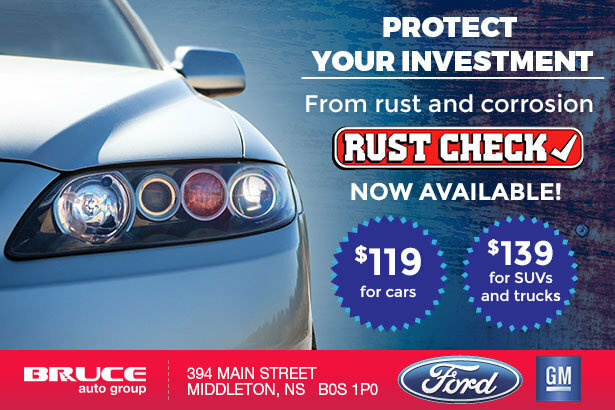 To learn more about Rust Check, as well as other services available at our Bruce Auto Group dealerships, contact us today!